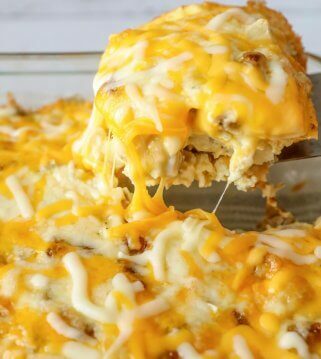 A casserole version of a classic breakfast dish!! 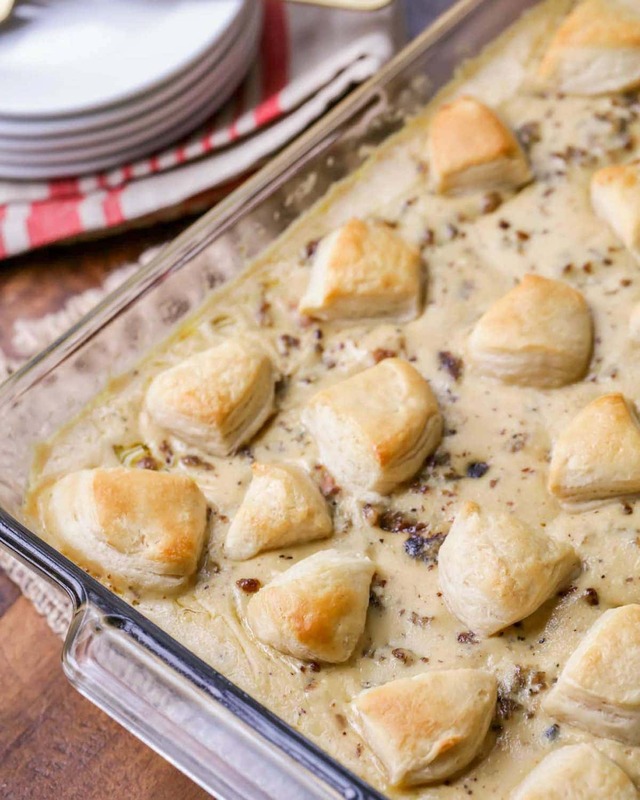 This Biscuits and Gravy Casserole is simple and perfect for weekend mornings and holidays – especially if you’re feeding a crowd! Our family has been making Biscuits & Gravy for as long as I can remember. 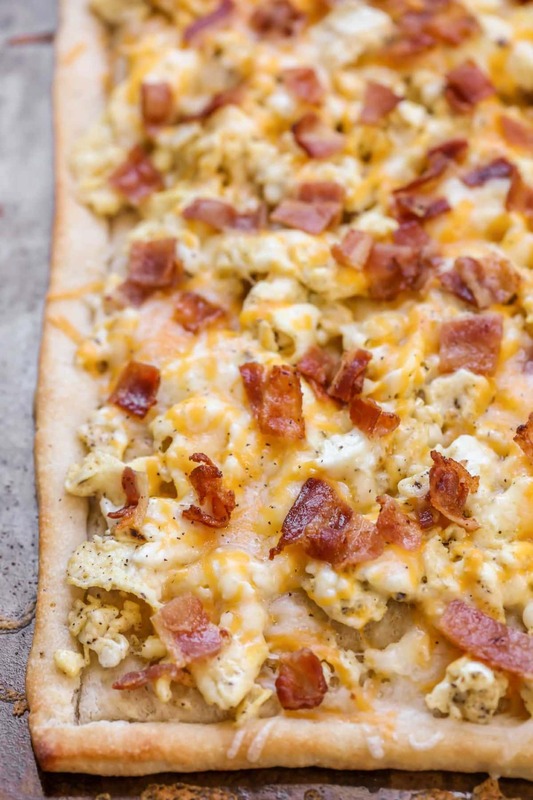 It’s one of our classic go-to breakfast recipes and it’s a dish we make every year for our annual White Elephant Exchange. We recently saw a recipe for a Biscuits and Gravy Casserole recipe that we were anxious to try (from Jamie Cooks it Up). So glad we did, because it was awesome! This recipe is bursting with flavor and was a cinch to put together. 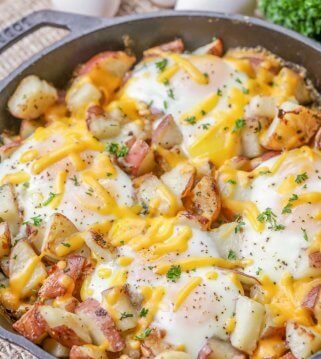 We love that it’s so simple and can be enjoyed for breakfast, brunch or even brinner (breakfast for dinner). Cut each biscuit into four chunks and spread half of them out evenly in a greased 9×13 pan. Bake at 400 degrees for 10 minutes. Meanwhile, brown the sausage in a skillet. Combine dry ingredients and add to browned sausage, stirring well. Add in remaining wet ingredients and mix until everything is combined and mixture is thickened. 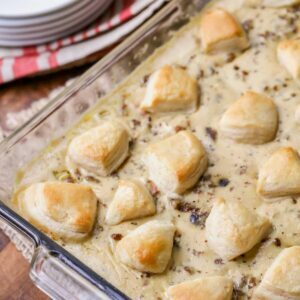 Pour sausage gravy over partially baked biscuits, layer remaining biscuits on top of the gravy, and bake for another 15-20 minutes until biscuits are golden brown. Brush softened butter over tops of biscuits and serve right away! Can this be made ahead of time? Yes. You can make the night before or morning of, but be sure to store it properly. Cover tightly with aluminum foil in the fridge until ready to bake. 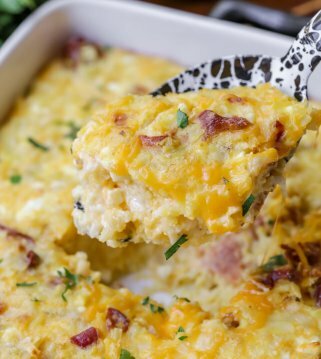 We promise you can’t go wrong with this casserole recipe of a classic breakfast dish. It’s delicious! 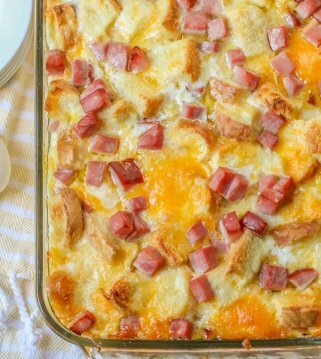 A casserole version of a classic breakfast dish!! 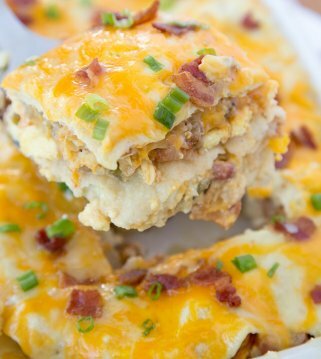 This Biscuits and Gravy Casserole is simple and perfect for weekend mornings and holidays - especially if you're feeding a crowd! Remove biscuits from cans and cut each into four chunks. 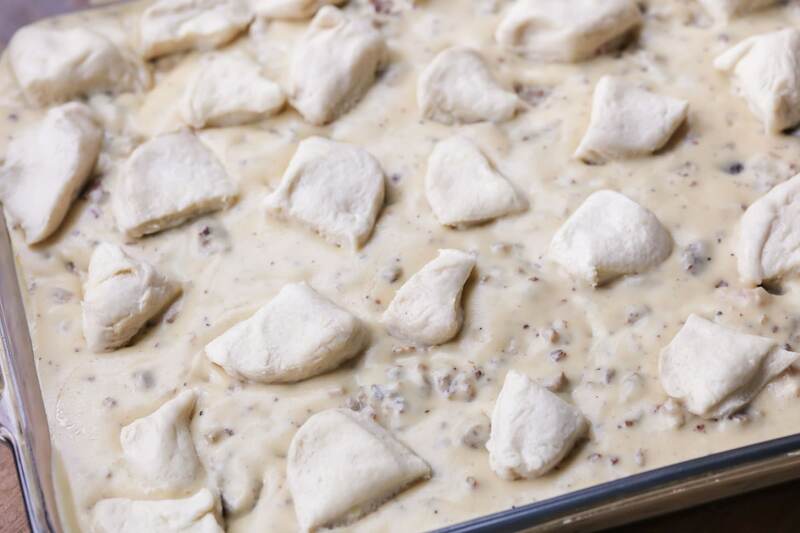 Lay half of your biscuit chunks out evenly over the bottom of a sprayed 9x13 pan. (Be sure to use a deep pan or one that is larger than 9x13). While the biscuits are baking, brown 1 lb sausage in a skillet over medium high heat. In a small bowl combine flour, salt, pepper, and garlic powder. Add to browned sausage and stir well to combine. Pour milk into the pan and stir, allowing mixture to become thicken and bubble, about 5 minutes. Add 2 cans of cream of mushroom soup (undiluted) and Worcestershire sauce. Stir it in to combine and allow it to heat through. 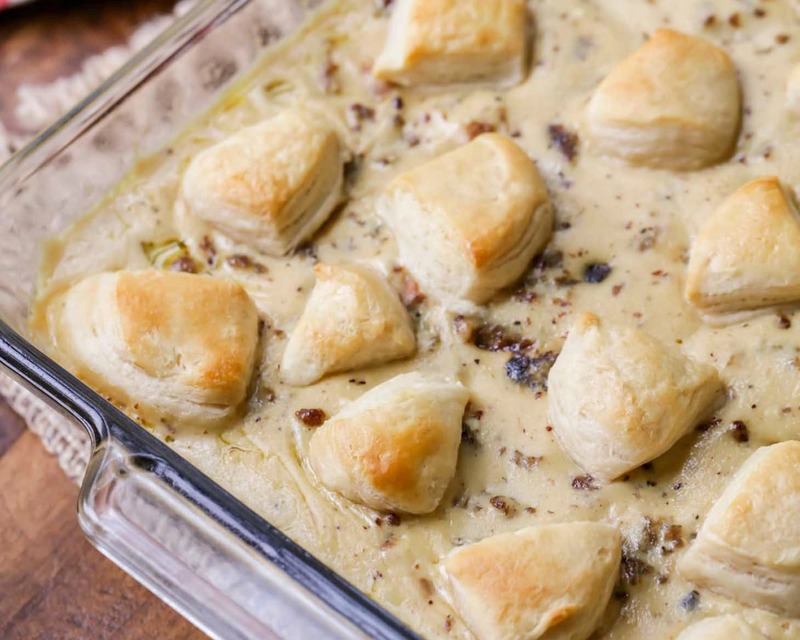 Carefully pour sausage gravy over the top of the partially baked biscuits. Layer the remaining biscuit chunks over the top of the gravy. Bake for 15-20 minutes at 450 until biscuits are golden brown. Brush softened butter over the top of the biscuits. This is awesome! Going to make these with your new homemade biscuits recipe from last month!